Dimensions 1 by 6.75 by 9 in. While Web 2.0 was about data, Web 3.0 is about knowledge and information. 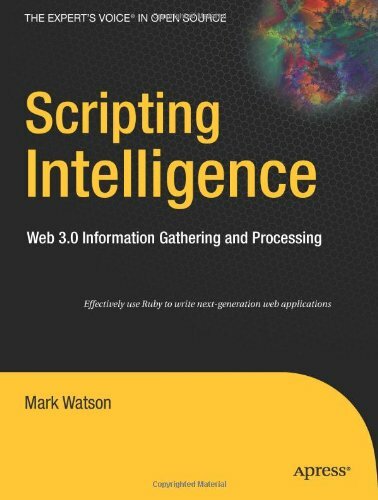 Scripting Intelligence: Web 3.0 Information Gathering and Processing offers the reader Ruby scripts for intelligent information management in a Web 3.0 environmentÃ¢ÂÂincluding information extraction from text, using Semantic Web technologies, information gathering (relational database metadata, web scraping, Wikipedia, Freebase), combining information from multiple sources, and strategies for publishing processed information. This book will be a valuable tool for anyone needing to gather, process, and publish web or database information across the modern web environment. Gather and process information within the Web 3.0 environment. See the flexibility of scripting with Ruby to gather and process information. Extract text from various document formats. Work with the Resource Description FrameworkÃÂ (RDF) data model and SPARQL query language, the foundations of the Semantic Web. Use GraphViz for data visualization. Extract information from relational databases and web sites.